What you see above is, testing of Combat Sky satellite communication balloon from the deck of the amphibious assault ship USS Boxer (LHD 4) by members of the Arizona Air National Guard. larger than a weather balloon. has the potential to provide communications between ship and helicopter, ship to shore, and between those on shore. communications payload are: global positioning systems, radios, and a hanging antenna. There are separate radios, one to control the payload and another, a communications repeater, for personnel to communicate with each other. helium filled balloon operating at an altitude of 60,000 – 85,000 feet above sea level. on completion of mission, the payload descends through a parachute attached to the balloon and then the balloon goes up to 120,000 feet, freezes, and bursts into many tiny pieces. 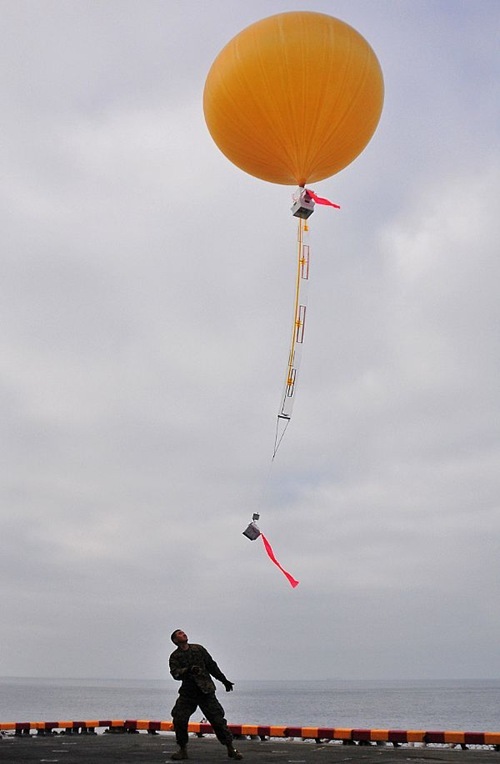 Read more about Combat Sky satellite communication balloon from U.S.Navy.